Howard Hawks' 'His Girl Friday' is a popular classic, renowned for its snappy and rapid dialogue. I went into this hoping for a good quality showing, I got something a lot more. 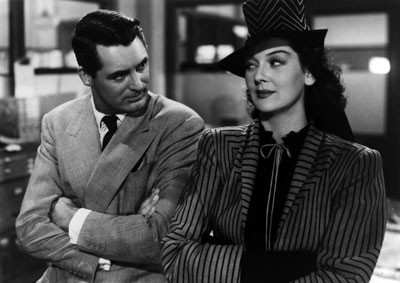 'His Girl Friday' is hysterically funny and a brilliant satire of media influence. When his ex - wife and best journalist, Hildy Johnson, is on her way out of town and on the verge of remarrying, Newspaper editor Walter Burns attempts to do every thing in his power to prevent her leaving. Fortunately for Walter, the biggest news story in two years has broke out and has seen the escape of a convicted felon, Hildy gets the journalists itch. What struck me instantly about this film, is that after 72 years since its release, 'His Girl Friday' is still unbelievably funny. Charles Lederer's incredible screenplay is still so incredible and so hilarious and the actors portraying the roles are absolutely perfect. The film depicts the media as heartless type of business, full of leaches who are willing to do anything to get a good story, even if that means ignoring the facts. Although its left quite ambiguous, I think were supposed to believe that Earl Williams is indeed an innocent man, but he is never really given a chance due to the fact that the media have already labeled him as a monster. The film is based on a play Ben Hecht, and the plays influence is quite obvious because it feels somewhat like watching one on screen. There is no overly extravagant set pieces and the film mainly consists of only three venues where the story progresses, This was an aspect I loved about this film. I thoroughly enjoy character based films and that's what 'His Girl Friday' is. The two leads of the film are phenomenal. Cary Grant absolutely embodied the phrase 'Film Star', he has an undeniable presence to him aswell as charisma that can hardly be contained by the screen. Grant's performance here is comedic gold, and despite the fact that he is absent for long periods throughout the film, he still gives an iconic performance. Rosalind Russell is also incredible as Hildy, her performance is very funny and always enthralling. 'His Girl Friday' is a fantastic film and is thoroughly deserving of its reputation as a classic. Incredibly funny, beautifully made and always enjoyable.